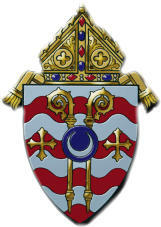 The Diocese of Crookston, suffragan of the metropolitan See of St. Paul and Minneapolis, was established December 31, 1909, from the western half of the Diocese of Duluth, MN, comprising 17, 210 square miles of western Minnesota, comprising the 14 counties of Kittson, Roseau, Lake of the Woods, Marshall, Polk, Red Lake, Pennington, Clearwater, Beltrami, Norman, Mahnomen, Hubbard, Clay and Becker. From East: Enter Crookston by Hwy 2 W. Turn RIGHT on N. Broadway/US - 2 W. Turn LEFT on 6th St / US-2 W. Turn LEFT on Memorial Drive. Turn RIGHT at 1200 Memorial Drive.